NASA’s Mars rover Opportunity has driven more than half of the distance needed to get from a site where it spent 22 months to its next destination. The rover has 800 meters to go to finish a 2-kilometer dash from one crater-rim segment, where it had worked since mid-2011, to another, where mission controllers intend to keep Opportunity busy during the upcoming Martian winter. Opportunity landed on Mars January 24, 2004, for what was expected to be a three-month mission. Opportunity’s view above shows a flat area called Botany Bay on the way toward Solander Point, which is visible on the horizon. Opportunity departed the southern tip of the Cape York segment six weeks ago and headed south for Solander Point. Both are raised portions of the western rim of 22-kilometer-wide Endeavour Crater, offering access to older geological deposits than the rover visited during its first seven years on Mars. 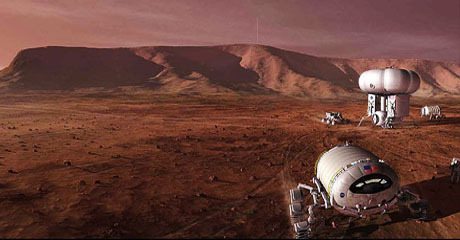 For more about Spirit and Opportunity, visit https://www.nasa.gov/rovers and https://marsrovers.jpl.nasa.gov. You can follow the project on Twitter and on Facebook at https://twitter.com/MarsRovers and https://www.facebook.com/mars.rovers.